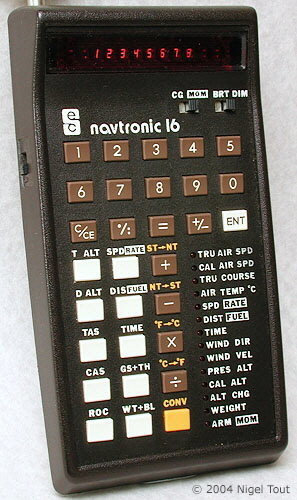 Specialized Electronics Corporation Navtronic 16. Not displayed here is another model, the Heathkit OCW-1401 Aircraft Navigation Computer. Distinctive features: Navigation calculator with 60 keys. Display is scientific notation 10 digits mantissa and 2 digits exponent, red LED. 103 x 154 x 34 mm (4.1" x 6.1" x 1.3"). Named after its navigation functions and the number of buttons. Specialized Electronics Corporation (SEC) Navtronic 16. Distinctive features: Aircraft navigation calculator. Main integrated circuits - National Semiconductor NS MM5728N and MM57129NBL/N, here date coded mid 1976. 6v (4 x AA batteries) . 81 x 151 x 38 mm (3.2" x 5.9" x 1.5"). Specialized Electronics Corporation, 4428 North Elston Ave., Chicago, Illinois 60630. 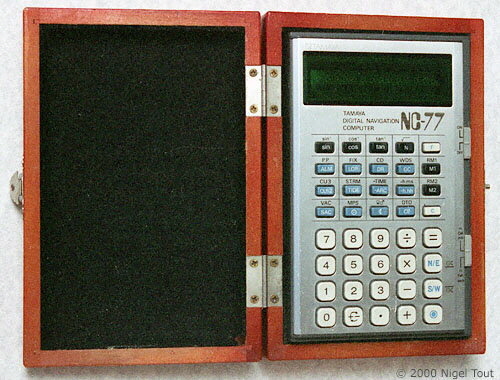 This is a very specialised calculator and has integrated circuits dedicated to navigating in aircraft. 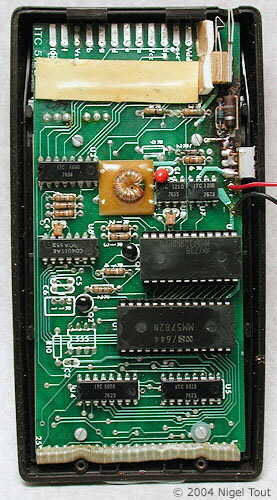 The circuit board of the Navtronic 16, showing the NS MM5728N and MM57129NBL/N main integrated circuits. These devices are mounted in sockets so can be easily replaced if necessary in this expensive calculator. 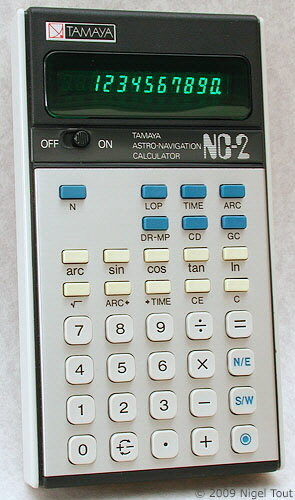 Tamaya NC-2 Astro Navigation Computer. 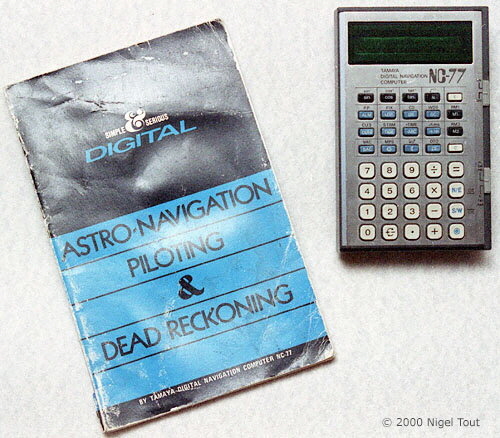 Distinctive features: Astro navigation calculator. 82 x 150 x 28 mm (3.25" x 5.9" x 1.1"). About 1976 (date on instruction manual). Tamaya is a well known manufacturer of navigation instruments and produced mechanical instruments before these electronic calculators. 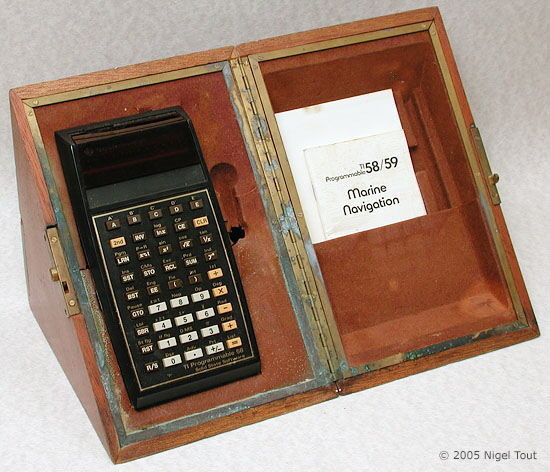 This is also a very specialised calculator using dedicated integrated circuits. The fitted wooden case is evidence of the respect which Tamaya had of its intruments. 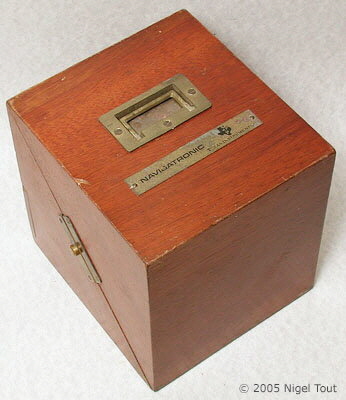 The Tamaya NC-2 in its fitted wooden case. 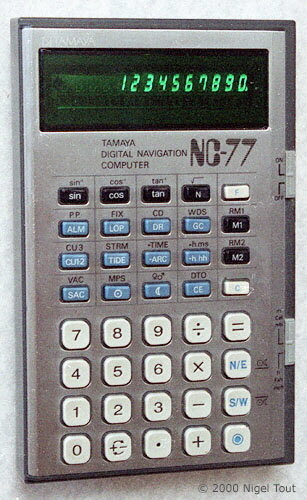 Tamaya NC-77 Digital Navigation Computer. 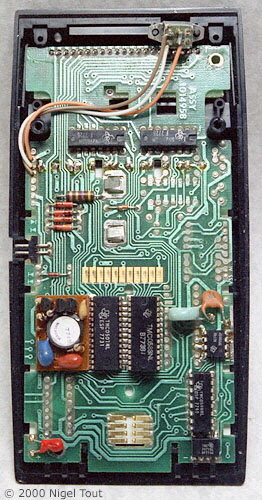 Integrated circuits - Surface mounted, types SC38664 and SC38665, here date coded early 1978. Produced from 1978 to 1991. Tamaya is a well known manufacturer of navigation instruments. It has a website which gives the above production dates. The website also gives details of how to use the calculator into the year 2000 and beyond. By entering the date as the 99th day of the 99th month of 1999 !!! it is possible to use it up to June 23 2007. A table to print out gives all the necessary conversions. If this is too troublesome you can buy the latest model the NC-2100G. Production over the the 14 years of 1978 to 1991 is probably a record length of time for any electronic calculator of the 1970s. 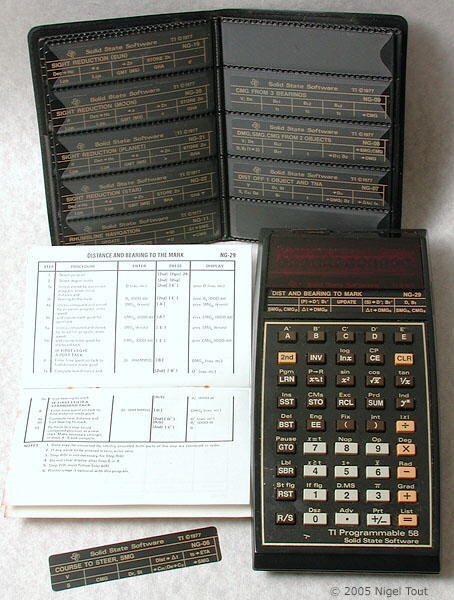 It is beaten by the Hewlett Packard 12C financial calculator which was introduced in 1981 and is still in production. 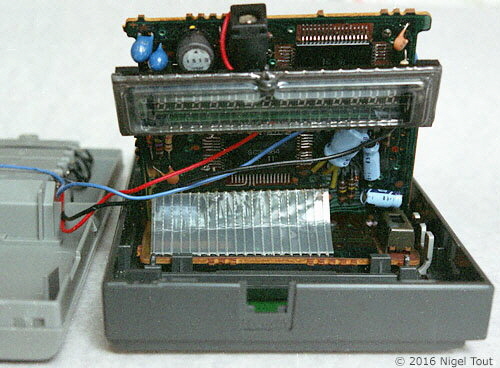 The Tamaya NC-77 appears to have been manufactured by Sharp - the casing closely resembles that of the Sharp EL-8018. 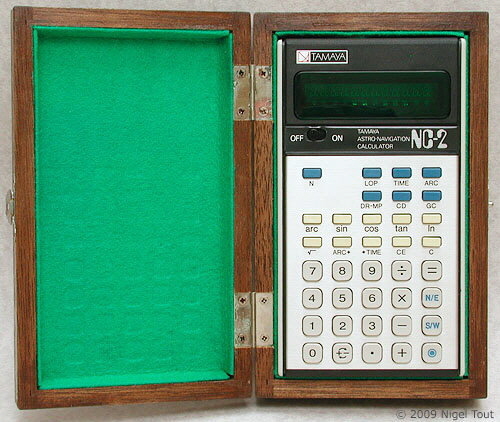 The Tamaya NC-77 in its fitted wooden case. Inside the Tamaya NC-77. The "quad flat package" surface mount integrated circuits can be seen at top-right and in the centre. 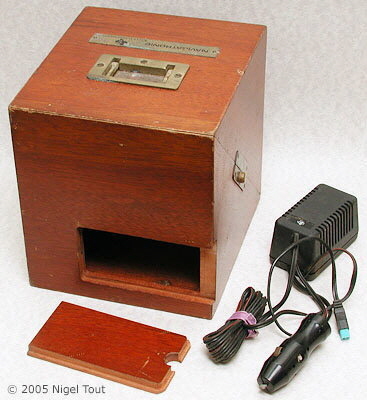 The Navigatronic in its opened wooden case which presents it at a convenient angle for use. Distinctive features: General purpose programmable calculator fitted with a Navigation Module. Scientific programmable and Navigation functions. Main integrated circuits - Texas Instruments TMC0501 and TMC0583. The calculator casing here is date coded mid 1978. Rechargeable battery pack containing 3x AA batteries. Calculator size is 80 mm x 146 mm x 34 mm (3.1" x 5.75" x 1.3"). 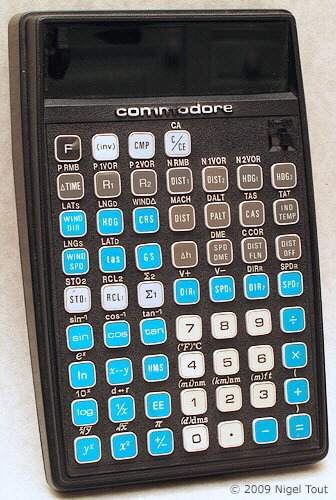 In contrast to the SEC Navtronic and the Tamaya NC-2 & NC-77 this is a general-purpose Texas Instruments Programmable 58 calculator which is reprogrammed by the Navigation Module to give a navigation calculator. 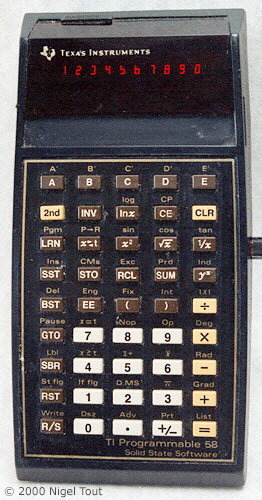 The TI Programmable 58 calculator. 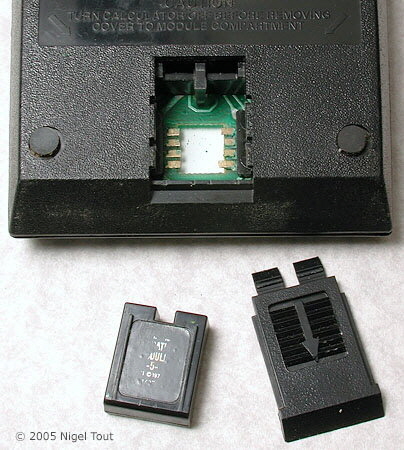 The Navigation Module is inserted in the back of the calculator in place of the standard Master Library Module. The Navigatronic has a wallet of plastic inserts. These can be inserted in a slot above the keyboard to show the remapping of the top row of keys when running the different programs stored in the Navigation Module. In the rear of the case is a compartment for storing the convertor for operating the calculator from a 12v DC supply.